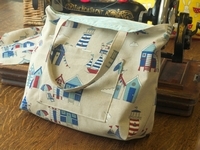 Welcome to Sew and Sea - Teignmouth's sewing and knitting shop. For those who don't know, Muddy is a nationwide blog that bills itself as "The urban guide to the countryside". Sharon, the editor of Muddy Devon, came to Teignmouth for a 24-hour family stopover in January, and loved it. You can follow the family's adventures here - and if you scroll down to the "Get Crafty" section you can read about their visit to us, which was great fun. It's fantastic to see Teignmouth getting so much interest and making such a good impression, although- as anyone who lives here knows - we shouldn't be surprised by that! Please use this area to tell us what your interests are, and if you would like us to phone you, please leave your number here too. We are Teignmouth's sewing and knitting shop, tucked away on Brunswick Street in the Arts Quarter. We're here to help you sew much more and sew much better, which we do through our courses, workshops, the shop and online. We also stock Patons yarns & patterns, and Pony knitting pins, crochet hooks and accessories. Ours is a small enthusiastic business that we set up because we enjoy it. Our shop is at 24, Brunswick Street, Teignmouth for quality haberdashery, fabric, sewing machine sales and accessories and, of course - what we're really here for - our sewing courses and workshops. We also have gift vouchers if you're looking for a flexible present. Whether you're already sewing or just getting the bug, we'd love to see you in to our bright and cheery shop - we're open Tuesday to Saturday 10 am to 5 pm for you to come and browse or chat about sewing. If you can't get here in person give us a ring, email or find us on Facebook. For beginners, we have fun workshop sessions where you can learn the basics and make some great home projects, or we can introduce you to the beginnings of dressmaking. If you're just starting in sewing we have everything to get you going, with all the essential equipment right up to the latest electronic sewing machines. 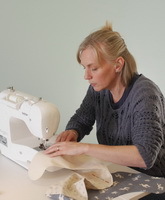 If you are already sewing but looking to enhance what you do, we have a range of more advanced courses and workshops where you can sharpen up your skills or learn new techniques, and everything you need to put them in to practice. We can service or repair your machine to keep it in tip-top condition for you, all done in house. Because we love what we do, our advice is always free, honest and informed. Smiles and a generally cheery attitude are also included! 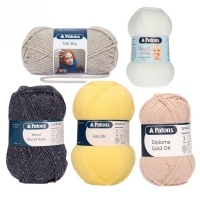 We now stock Patons yarns for knitting and crochet, plus Pony knitting pins, crochet hooks and accesories. You may have noticed there are no adverts on this site, nor are there any tracking cookies. We work on the basis that if you like what we do you will come back, and you will not like what we do if you are constantly bombarded with junk offers. If you sign up for our newsletter we will send you occasional updates about our shop, courses and workshops but we guarantee that we will never sell, or even give, your information to anyone else. We ask for your name and email address so we can send the newsletter to you, and an indication of your sewing interests so we can respond to you appropriately. We do not store any contact or customer data from our general contact form on our web server and we don't include any personal information in our online calendar. If you have booked a course or workshop we will use your data to communicate with you about the event (for example, if we have to rearrange a date), but will only hold your name, email address and phone number. By using our online shop you will be giving us some personal information which is necessary for the completion of the transaction. We limit this to your name, postal address, email address and telephone number as well as details of what you are buying and to where it will be delivered. We do not store payment information.